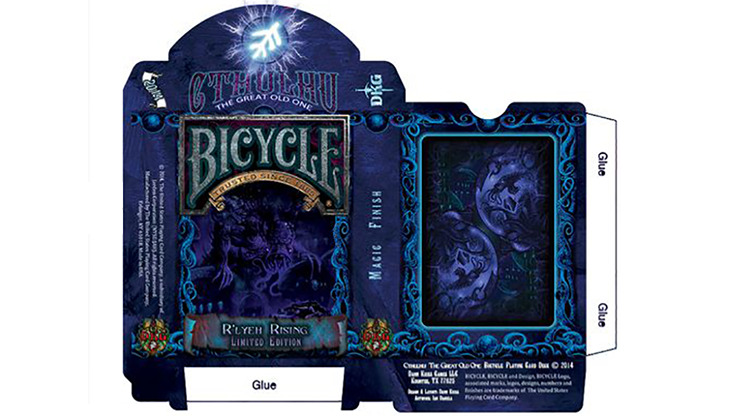 This final deck in the CTHULHU: The Great Old One Bicycle series is the Limited "R'lyeh Rising" Edition, which will only be printed once. As Cthulhu awakens and rises from R'lyeh, so does CTHULHU: TGOO rises from the depths to the light of day! Cthulhu sleeps no more! Each card is designed to evoke the alien, deep water nature of the fabled (and feared) sunken city where Cthulhu lies dead but dreaming. Remember, this is a single printing - when this deck runs out, it is gone forever.